Historic St George’s Hotel is pleased to announce the appointment of Mr Philip Newmarch as the new General Manager of the Hotel. This senior appointment follows the recent acquisition of Rowton Hall Hotel and Spa in Chester by Anderbury Ltd, an independent group of award-winning properties that also includes Hatherley Manor Hotel and Spa in Gloucester. Mr Newmarch has a wealth of experience in working in a number of leading hotels throughout the North West, including Peckforton Castle Hotel, Craxton Wood, Carden Park and more recently the Abode in Chester. 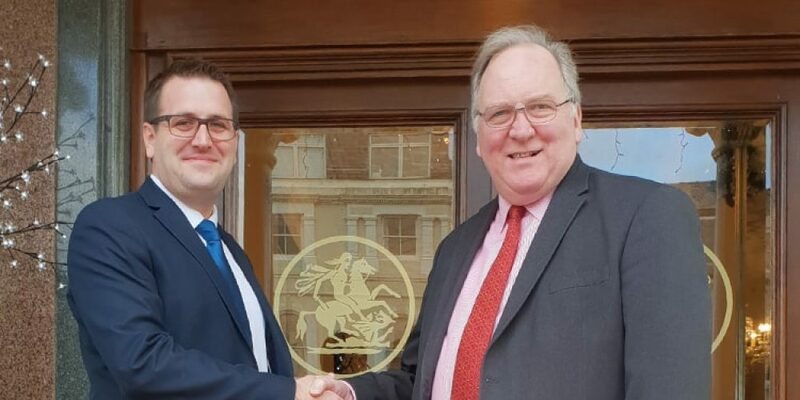 Commenting on his appointment, Philip said, “I’m excited to be taking on the role of General Manager at the iconic St George’s Hotel and I am looking forward to working with such an experienced and enthusiastic team. Having worked in a variety of hotels across Cheshire I am looking forward to continuing to build of the hotel’s proven success. Speaking of the new appointment, Mr Tony Burns, now the Group Operations Director of Anderbury Ltd, commented. “Philip is joining the team at the perfect time, after almost 25 years in managing St George’s I am pleased to be handing over the managerial reins to him so that I can concentrate on the further development of the Anderbury Hotel Group which has recently expanded this year after the acquisition of Rowton Hall Hotel and Spa in Chester in June. We are thrilled that Philip has come on board, and his valued management experience will go a long way in helping us deliver a seamless guest experience at one of the leading hotels in Wales. St George’s has 81 beautifully decorated rooms with air-conditioning, high speed internet access, LCD TVs, luxurious Egyptian cotton duvets and many offer stunning views across the bay of Llandudno. Among the bedrooms are the new Rooftop Rooms which were completed last summer. These rooms capitalise on their elevated position and stunning Orme to Orme view by having large glass patio doors leading out onto a panoramic seaview balcony. The rooms also benefit from having some of the latest in-room technology, stunning bathrooms with walk in shower plus ‘His and Hers’ sinks and guests are able to enjoy a personal concierge service offering a range of tailored services. The hotel has a variety of dining options to suit all tastes including the AA Rosette winning Terrace Restaurant, serving a mouth-watering selection of dishes sourced within Conwy and North Wales. The Terrace Lounge serves light lunches, traditional afternoon teas and the best espresso and cappuccino in the area. St George’s Hotel has seven function rooms including the stunning Grade II listed Wedgwood Suite which is one of the largest function rooms in North Wales and has hosted many prestigious events in its 150-year history including political party conferences for Labour, Conservatives and Liberal Democrats, esteemed Guests have included Winston Churchill among others.